Wetherby is no stranger to celebrations, but last week’s puppy party must have been a first for the town. Fundraisers gathered in the Market Place to meet Wetherby, the trainee guide dog named after the town, for his very own puppy shower. 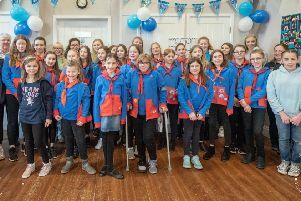 The Wetherby fundraising branch of Guide Dogs was the first int he UK to be allowed to ask local businesses and the local community to contribute to a name a puppy scheme. The branch had to raise £5000 on top of their usual fundraising efforts and were able to name a puppy they were sponsoring. The group choose the name Wetherby or course after raising the money in just eight months. Wetherby is now nine months old, and is placed with his puppy walker, Linda. He will be with her until he is about 14 months, old when he will go for his advanced training for six months. After that it is hoped that Wetherby will then be matched to a visually impaired person. Wetherby will work until he is about eight to ten years old, giving vital independence, confidence and freedom to a blind or visually impaired person. The cost of a guide dog over its lifetime will be £50,000, Guide Dogs receive no government funding, they are purely funded by donations and legacies. While in Wetherby, Wetherby enjoyed a tea party and bake sale in his honour and had the chance to meet Robbie Lee a Boston Spa schoolboy who is visually impaired. The youngster is desperate for a guide dog. Mrs Bradshaw said: “He can’t wait until he is old enough to have a guide dog of his own. Wetherby businesses that contributed were:- NatWest, Mulberry Office Solutions Ltd, Sant Angelos who allowed the branch to hold a raffle on their premises. Others who contributed to the fund were:- The Wetherby Lions, a group of Wetherby men who cycled from Liverpool to Leeds on the canal for sponsorship (Dave Wheelhouse, Adrian McVoy, Tom O’Connor and David Bradshaw), and there was a donation from the estate of the late Eric Field. Wetherby Guide Dog fundraising branch are seeking more volunteers, if anyone is interested they can phone 0845 371 7771 .